Your tour will begin at the historic and renowned Oakland International Airport. Immediately after take-off, you’ll see the most beautiful and breathtaking views of the San Francisco Bay Area. Enjoy a 35-minute flight over the San Francisco Bay Area including views of: Downtown Oakland, Bay Bridge, Downtown San Francisco, Golden Gate Bridge, Sausalito, Alcatraz Island, Pacific Coast, Palace of Fine Arts, Fisherman’s Wharf, Coit Tower, Port of Oakland. Everyone knows the Bay Area for its stunning beauty and famous landmarks, but this tour will take you sky high, and take your breath away. With a choice of 3 afternoon departures, multilingual pilots and small crowds (tours are limited to 6 people, and every seat is a window seat) you'll get once in a lifetime experience when you tour the San Francisco Bay Area from above. 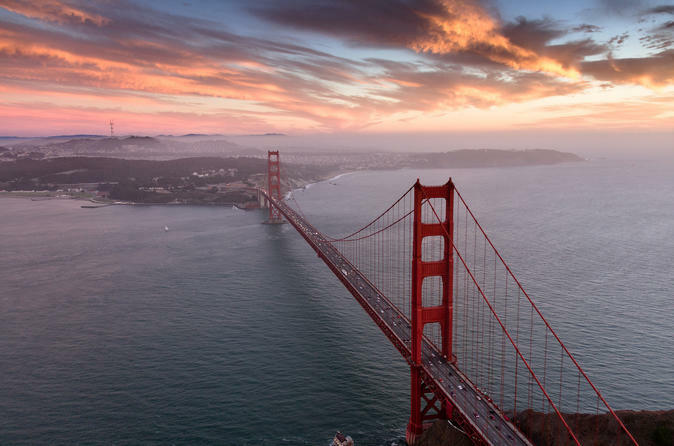 See the Golden Gate Bridge, Alcatraz Island, Fisherman's Wharf, Coit Tower, Sausalito, The Port of Oakland, Downtown San Francisco and much, much more. The sky's the limit with this unforgettable opportunity.